Following last Friday's post about the Cold Shoulders trend, I`ll show you today how to add that little extra something to an off-the-shoulder outfit. To enhance the structure of my neckline and to create definition to this area, I like to contour my collarbones subtly. Some of you might get intimidated by the word Contouring but trust me it is quite simple. Just follow the steps below. Every time I wear a deeper neckline, I make sure to put a little bit of makeup on my decollete. That way my face and my chest area have the same texture and more evenly skin tone. 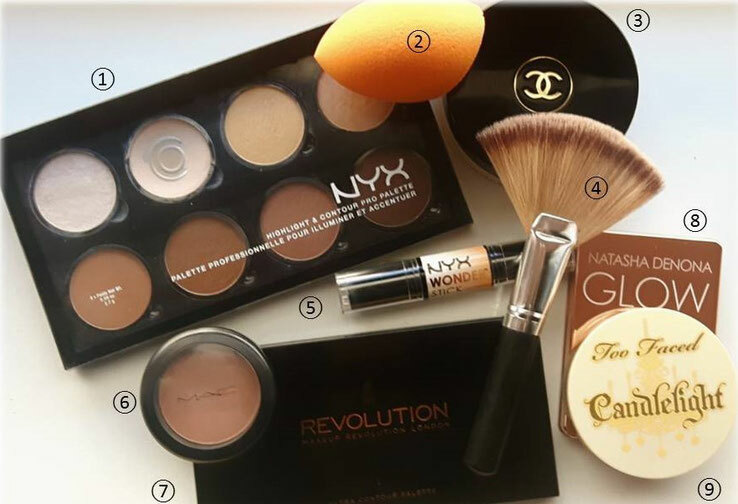 To contour, you can use cream or powder products. If you solely use powder products, you`ll receive a more matte finish. By using cream products, your result will be dewier. Your contour colour has to be one or two tones darker than your skin tone. And it needs to be matte to create the illusion of an actual shadow. Try to find a shade with beige, taupe, or grey undertones that suit your skin tone. Your highlighter, on the other hand, can be shimmery. Choose a shade that is one or two tones lighter than your skin. If you have a warm skin undertone, choose a highlighter in gold or champagne tone. Pick a more pink or rose highlighter if your skin undertone is cold. Below you can see some of my favourite products to contour and highlight. 1. I always start with the contour shade. First, I make sideway triangles on each side of my collarbone. Then I contour under my collarbone by adding a diagonal line to the underside of my collarbone. 2. Afterwards, I am adding the highlight shade by placing it directly onto my collarbone. The highlighter will make your collarbone stand out a little bit more. 3. Then you need to blend it in. Blending means to diffuse the colour until you can`t see any harsh lines, just a subtly enhanced area. My advice is to finish one colour completely and then move on to the other one. I prefer to begin with the contour shade. To blend, you can use a makeup brush or a sponge. I favour a dampened sponge. If you use creams, you have to set them with powder. For a natural finish use a colourless setting powder. RCMA's NO COLOR powder is my favourite. To intensify the look, set the creams with a highlight and contour powder. My brush of choice, for setting or to simply contour with powders is a fan brush. It blurs the lines easily, for a naturally enhanced neckline. I love the effect of this technique. Let me know what you think in the comment section. Habe ich ausprobiert,nach mehrmaligem Üben ist es ganz gut gelungen.